Jean de Novelonpont, the present Nouillonpont, on the right bank of the Othain, of the arondissement of Montm�dy -- was also called Jean de Metz, squire. It was he who discovered Jeanne, when she was dressed in a poor red dress, and when she was lodged in the house of Henri le Royer. And he said to her: "My friend, what are you doing here? Is the King going to be chased out of his Kingdom and are we going to be English?" And the Maid replied: "I have come here to the King's chamber to speak to Messire Robert de Baudricourt, so that he will take me to the King or have me taken to him. And he hasn't troubled about me or my words. Nevertheless, before mid-Lent, I must go before the King even if I wear my feet[better translated as legs] off to the knees. For no kings or dukes or king of Scotland's daughter or anybody else in the world can recover the Kingdom of France; there is no aid but myself although I should rather drown myself before the eyes of my poor mother,for it isn't of my estate[the following alternate translation that appears much more accurate has been provided by Brian Rahilly as follows: "Although I liked more to spin (wool) beside my poor mother, because this(war-faring) isn't my work"]. But it is necessary that I come, and that I do this, for Our Lord wills that I do it." Then the young squire believed in her, promised to take her to the Dauphin, and gave her his attendants' clothes. We learn that upon the arrival of the Maid in France, on April 21, Jean de Nouvilonpont received from Guillaume Charrier, receiver-general of the King, 100 livres for his expenses and those of the Maid's company in the town of Chinon. That same month he received 200 livres more for "the Maid's expenses" and 125 livres to procure armor for himself. He was lodged at the house of Jacques Boucher, the treasurer of Orl�ans, and was ennobled by the King in March, 1444, "in consideration of the laudable and very welcome services which he has rendered us in our wars and elsewhere." Gobert Thibault, equerry of the King and judge of the city of Blois, who testified at the time of the Rehabilitation, numbered him among his friends. Jean de Nouvilonpont was questioned as a witness in the course of the Rehabilitation sessions. He was described as a nobleman living at Vaucouleurs, and about sixty-seven years old. 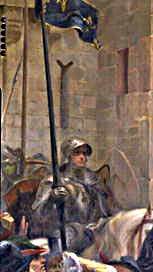 ****Jean de Metz would have been 41 years old when he first met Joan of Arc in early 1429 based upon his age of 67 in 1455 when he testified at Joan's Trial of Nullification.